Efficient, durable, economical! Countless uses in repair shops. Professional grade 3M Gold sandpaper with handy self-adhesive backing. Stikit™ abrasives cut like a file, and last longer than regular sandpaper. The sharp aluminum oxide grit is slower to load up with sanding dust, too. Outstanding durability and performance have made Stikit the favorite in our own shops. Stikit papers are supplied in 15-yard rolls (45 feet / 13.71 meters), an economical length for small shops. 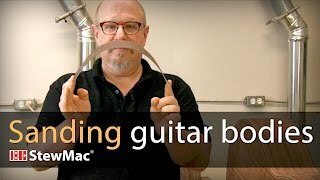 Michael Greenfield of Greenfield Guitars explains clearly why it's critical to have properly shaped and sanded guitar bodies before you rout them for binding. Michael shared this great Trade Secret with us during the 2013 Northwoods Seminar last August. There was a time when I would adhere sandpaper to a surface with double stick tape, but the time it took to remove the sandpaper, tape and adhesive residue was too much wasted time. This self adhesive tape is much more convenient and saves a lot of time. would not be without it after I have used it for 20 different things! Good stuff. Last a long time. Sticks good to sanding block. I do serious level sanding on a leftover piece of granite backsplash. I cleaned it well, but found that the stickum on the 3M tends to curl on that surface. I resolved the issue with using a piece of double sided tape (obtained from StewMac) to the granite surface (which I had used before with regular 3M with fine outcomes) and then sticking down the 3M paper. Works fine now. I like the width and not having to mess with cutting and splicing sandpaper sheets...I can now get enough length to do complete fretboards and necks. Cuts cleanly and lasts a good amount of time. The adhesive holds great. It’s the perfect size for stewmacs radius blocks. It’s also on a large diameter roll so you don’t have to fight to stretch the last bit out, or throw the last few feet away because it wrinkles when you flatten it back out. I use this for fret leveling and it works great! Last way longer than ordinary sandpaper from local stores and adhesive side is just genius. This is the best sandpaper! Definitely the best and most useful sandpaper I've ever used especially for using in tandem with the fret leveling beam and sticking back to other tools for various applications. Definitely going to order more of the other grits. Yes pricey but worth the Quality and the fact they stick so easy on my levels and sanding blocks. I love them!